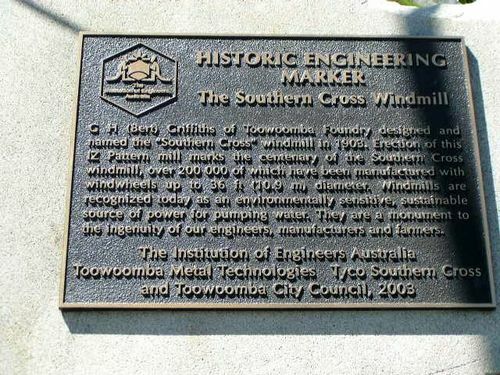 Historic Engineering Marker and Windmill marks the centenary of the Southern Cross windmill which was designed and named by the C.H. (Bert) Griffiths foundry of Toowoomba in 1903. The Southern Cross windmill, as designed and named by Bert Griffiths, became one of the great successes of the Toowoomba Foundry. This mill was such a simple, inexpensive and efficient mill that, by 1910, it had almost eliminated American mills from the Australian market. Before 1903, each windmill design was given a different name but the success of the Southern Cross design led to the decision to retain the name for.all future windmills, and, quite soon, the name was applied to all products of the Foundry. The windmill's success allowed the Foundry to regain stability and profitability after losing Queensland Government railway locomotive contracts to Ipswich in 1902. Southern Cross windmills serve as a monument in Australia's rural development, to the hardships and the ingenuity of the pioneers, and, not least of all, to the establishment of 'Southern Cross' as a brand of quality agricultural products. C.H. (Bert) Griffiths of Toowoomba Foundry designed and named the "Souhtern Cross' windmill in 1903. Erection of this 12 Pattern mill marks the centenary of the Southern Cross windmill, over 200,000 of which have been manufactured with windwheels up to 36ft. (10.9m) in diameter. Windmills are recognised today as an environmentally sensitive, source of power for pumping water. They are a monument to the ingenuity of our engineers, manufacturers and farmers.